Coming up with measurable goals is essential to achieving most sorts of things. It is even better when you can measure partial progress towards your goals, as in “you are 10% closer” – as opposed to “you made it” or “you haven’t” measures. Fortunately in measuring your energy footprint you have simple ways to get important measurements. Specifically, you can treat your gas and electricity bill as a meter that tells you how closer or farther away you are from your footprint goals. Water bills are also good, if they measure your individual consumption. Other bills (such as the quantity & quality of your trash) are harder to use as good “meters” to set goals against as large utilities charge “by the bin” or flat rates. My utility bill is full of useful information such as the following. My utility is courteous enough to include a trend graph for consumption for the year; and a comparison to last year’s data if available. Changes in my patterns – for example, did I travel out of town for work? Maybe I had out-of-town visitors that stayed at home for some weeks? Environmental changes – Especially the outside temperature and average duration of the day have a huge impact. Here in the Pacific Northwest, the longest day of the year is 16 hours long… and the shortest is 8h 2o min. That makes a huge difference on how long my lights are on or off, making it harder to compare one month against next. Accidents – did I leave the lights on? Maybe I forgot to close a window or a door and your heater strived to warm the Great Outdoors for a full winter day ? One bad day can throw your monthly average off. 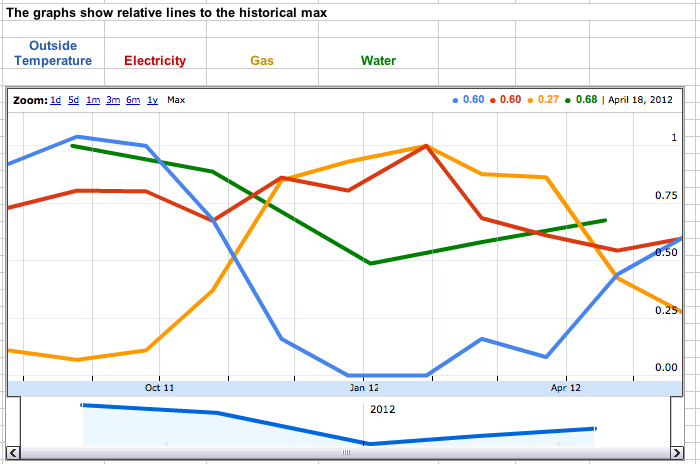 Charting your utility bills gives you critical feedback in reducing your footprint. The y-axis units are % of max to be able to compare different values. The latest upswing in electricity (red) has me puzzled, but I think I know what caused it. I think utilities should expose an API or let you download your data in some easy to process format, like a CSV or spreadsheet that can then be imported into Excel or Google Spreadsheets. Of course, the use of Smart Meters that report their data realtime would be great, but a lot of efforts in that direction are still not doing great. In the meantime, periodic data entry, and appliances that report their own consumption will do. Try doing this with your own utilities, you may learn something new! This entry was posted on Monday, June 4th, 2012 at 18:03	and tagged with Energy, Energy conservation, Energy consumption, Pacific Northwest, Smart meter, Utilities and posted in Electricity, Measure. You can follow any responses to this entry through the RSS 2.0 feed.